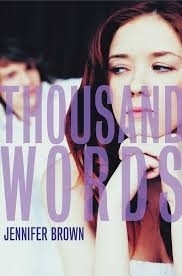 Thousand Words by Jennifer Brown has gotten some mixed reviews. One KHS student loved it and one hated it. It deals with a somewhat controversial topic (texting revealing photos) and the outcome of one girl's poor decision. This can be a topic that is uncomfortable for many of us to talk about and think about but it is something that happens a lot and often yields unpleasant consequences. Check out this book trailer for more information about Thousand Words and if it seems interesting to you, come by the KHS Library to check it out. You can also check out KHS student reviews of Thousand Words here.